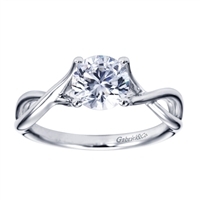 The contemporary style of this solitaire engagement ring allows full attention to be paid to the round center diamond in this engagement ring. 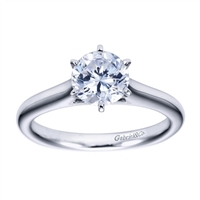 This gorgeous contrmporary solitaire engagement ring doesn't need any diamonds to shine! 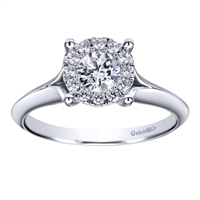 Its sleek and modern design are all the accompaniment a round center diamond needs. 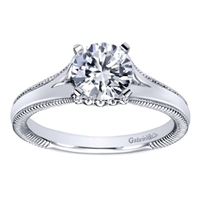 A graceful smooth band in white gold or platinum hols a round center diamond perfectly in this Gabriel & Co solitaire engagement ring. 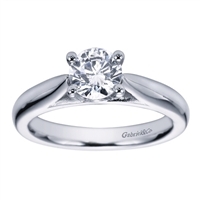 Sit a round center diamond in this contemporary solitaire engagement ring by Gabriel & Co. and she won't think twice! A simply stunning work of art is on display in this princess cut center diamond contemporary solitaire engagementr ring. A simple and clever solitaire engagement ring showcases a round center diamond with a criss cross band to add to the mystery of this diamond engagement ring. A sleekly styled and subtly designed split shank solitaire engagement ring that showcases perfectly a round center diamond. 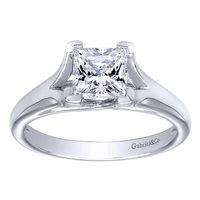 This solitaire engagement ring by Gabriel & Co. offers the eyes a little entertainment with a split shank leading up to the princess cut center diamond. 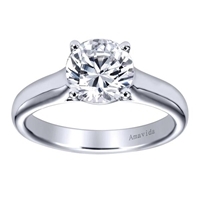 Simple and powerful, this contemporary solitaire engagement ring will let the round center diamond shine. 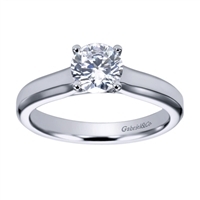 A solitaire engagement ring with a contemporary finish available in white gold or platinum. A firmly set round center diamond solidifies your commitment to each other in this 18k white gold contemporary solitaire engagement ring. 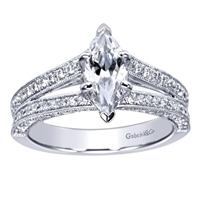 This split shank solitaire engagement ring perfectly capttures the shine of a round center diamond. This split shank diamond engagement ring perfectly holds a glistening marquise shaped center diamond in this fine engagement ring setting.